Drops from the special "Love is in the air" World event boss encounter in Shadowfang Keep. This is quite a versatile headpiece as the models will be very useful for both style and role-playing purposes. This seems to be a rose without thorns... how peculiar. The gender difference in equipped styles is really neat. For some reason, male tauren look more to me like they're eating it. Kinda makes you wonder on undead who have the no jaw feature. How does the rose stay in his mouth without a jaw? Are you certain you're not thinking of the bouquet of roses? First I whip it out, then I thrust it, with great force. Male characters tend to bite the stem with their mouths while females have its stem nestled in their left ear. Am I right to assume that this occupies the helm slot? Sadly, it cannot be worn in conjunction with Don Carlos' Famous Hat. I always wear this when healing on my druid. According to Wowhead, this item is refundable... to who exactly? I say you put it on his wife's grave. With a Medal of Honor. Edit: I don't see why you are downranking me, theres nothing wrong with a bit of humor! Can anyone confirm if this drops off the daily box, or Hummel? Whenever I see "Forever-Lovely" , i can't shake the feeling of thinking "Forever Alone"
As a female worgen, the rose is tucked back behind the right ear. But when I changed into my human form, it suddenly switches to behind my left ear! Level req is lvl 11 for SFK.. can a level 11 get in and get this rose? I would go test it myself but im afk for a good long while. Does it still drop from the bosses, or only the loot box? Killed the boss many times and nothing but stupid blue 346 items. I am wondering if this will be moggable, or if there will be a change to it in the 2012 version? It has no armor type. The new rules DO NOT mention stats but instead claim "Only common (green), rare (blue) or epic (purple) items may be transmogrified. " No talk of dis-allowing items without stats in a fairly long time. Cannot be used for transmogrification. Tried last night. I has a sad. Also an ugly hat. According to the new Love is in the Air blog post on the official site (link), we'll now be able to purchase this item with love tokens from Lovely Merchants this year! I'm so happy that they've made this change and it will no longer be luck based to obtain this item for all of those who want it like me :). While it's kind of disappointing that it can't be used for transmogrification, it's really for the best because you would have almost everyone doing it which would be ridiculous. To bad is not a transmogrificable item it just look so cute on female chars. 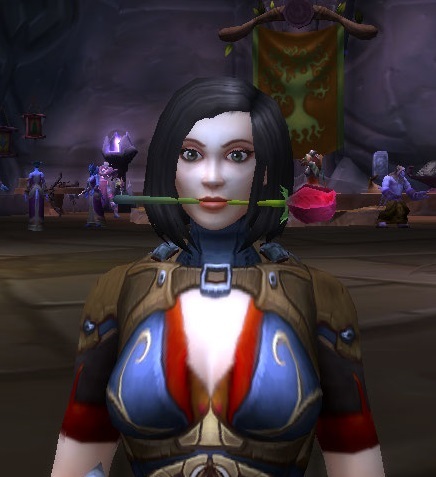 OH GOD, tell me i can transmog my helm to this and dance the tango in bgs! I have to admit, I cannot wait for my monk to get this item now that I see that males hold it between their teeth. Why? My male belf monk is named... Tuxedomask, and there is no tophat for him to wear. Holding a rose in his mouth is just absolutely awesome for his dress up set. Black tux, full cape, and finally a rose! so with the loosening of transmog restrictions... will this and hallowed helm be transmoggable? If they are not (sometime) going to make this Tmoggable, atleast they could have made it account bound so as 1 could send it to thier banker toon! Come on Blizz, work with us here! I have submitted a screenshot of it on my Panda, so to "Rubenessa's" comment below, they must have fixxed it so that it shows up now in the hair! I think it looks good! Please Blizz, make this a cosmetic item! I just saw this on someone today. I didn't know this item existed! Thank goodness Love is in the Air is nearly here. This + new selfie feature = saucy Twitter updates. Anyone know if this has become transmoggable this time around? Got this item today. Cant transmog it, wish i got the mount! This really, really should be turned into a toy and work the way Moonfang Shroud does (just replaces your headgear visually, no need to unequip anything). With this currently being soulbound, only being available to level cap players and requires you to take your headgear off to use it pretty much guarantees no one's really getting much out of this otherwise quite nice-looking and fun item. I have seen many comments from players wishing that this item (and many others) was available to be used for transmogrification, and I absolutely agree. The best way to see this happen is to make a suggestion directly to Blizzard. You can do this from the help menu in game. Open the game menu, choose 'help' then 'submit suggestion'. When writing your suggestion, include specific information such as the item number and correct spelling of the item you are referring to, and why you would like Blizzard to consider your suggestion. You can make suggestions about anything at all in the game. Always remember to be polite and to the point about any suggestion you make so that it will be taken seriously and have the best chance of being implemented! Good luck and I hope you have found this useful! Edit: This item, along with many other holiday items, can now be used for transmogrification, however only during the holiday. So now you can use this, but only for 2 weeks out of the year... Thanks Blizzard. Just checked for 2016, still not usable for transmog. I would say that the drop rate is significantly higher than 0.01% I've had it drop twice in 3 days. Of course that could purely be down to luck, but I highly doubt it. Temporarily on Legion beta, it showed up for females the same way for males, in the mouth. Edited because Muffinus said on twitter they're fixing it. On the 7.2.5 PTR this item can now be used for transmog and is added to your collection. However, this can only be used during Love is in the Air. You can’t buy it with Love Token, you can’t transmog it outside the actual holyday. I’ve tried for years now and it dropped for all my toons except the one I want to have it on. I can live with some random factor, but for once-a-year stuff it is just stupid.